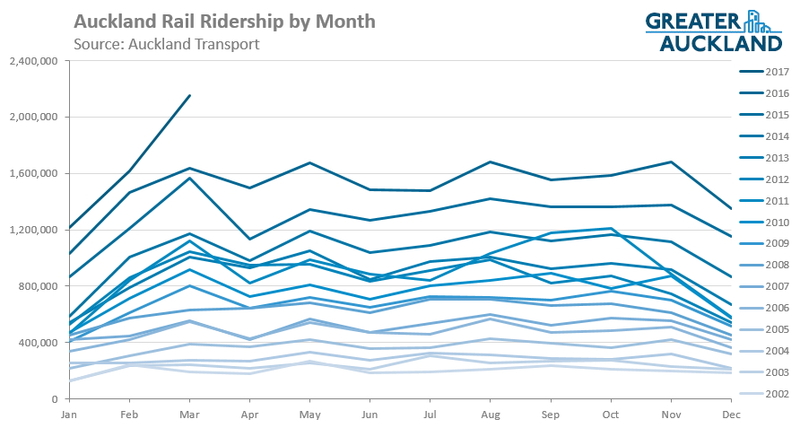 The public transport results for March are always the most anticipated of the year because we’re eager to see just how much March Madness lived up to its reputation. In past years we’ve anticipated big numbers because we’d seen the regular complaints about extremely busy services. However, this year was different. Auckland Transport added significant extra capacity prior to March resulting in only a handful of complaints about full buses and trains. In fact, everything seemed to be running so smoothly it reached the point I was concerned the lack of overflowing buses might indicate ridership had dropped. For me, this year the maddest thing I found about March was the level of media interest in it. Easter fell completely in April this year resulting in March having two extra working days. The three massive Adele concerts saw record numbers of people attend via public transport. Earlier this month AT had said we’d reached 19 million rail trips – indicating March must have been big. However, even taking these factors into account the results were impressive. Overall there were 9.41 million trips taken in March. That’s almost 1.3 million or 15.5% more than March last year, a huge result. Even taking into account the factors above, AT say the growth was a decent 7.6%. The result also means that for the 12-months to the end of March we had 86.99 million trips, up over 5 million on the same time last year. For the first time ever, more than two million trips were made in a month. All up there were 2.15 million trips on trains, this is up from 1.64 million trips in March last year. The rail numbers benefited more from the Adele concert than other modes but even taking that into account, I assume there still would have been more than 2 million trips. As the graph below shows, March-17 was head and shoulders above what we’ve seen before. If previous trends follow we’re going to be in for a year of some big numbers. This raises a few interesting questions to speculate over. We’ve been growing by a million trips about ever four months. Given we reached 19 million trips in early April, when will be hit 20 million trips? There are still significant potential drivers of usage in the next few years. This includes the new bus network roll-outs and improved off-peak frequencies. Just how high could ridership reach before 2023 when the CRL is opened? At what point do we order additional trains to provide extra capacity? We’ll need them long before the CRL opens. For much of the past two years bus numbers on the whole have been disappointing. There were of course bright spots, such as the great growth on the Northern Express but overall bus numbers were flat or even declined a little. The great news is the growth appears to be back and the numbers are starting to look really good. Like with rail, there were more trips in March than there have been in any month in recent history. There were 6.68 million trips in March, up from 5.92 million the year before. There were 61.89m bus trips in the 12 months to the end of March. Ferries were the mode disappoint this month and usage fell slightly compared to last year with 592k trips vs 598k in March-16. I wonder how much of this was tied to the weather events we had at the end of March and beginning of April. There remains just over 6.1 million trips on ferries annually. I think the important thing to re-emphasise with this, is that AT got it right. They put on additional capacity prior to March and, especially given the results, if felt like it paid off. While March’s results are fantastic, looking forward to April’s, we shouldn’t our hopes up too much for a similar outcome. 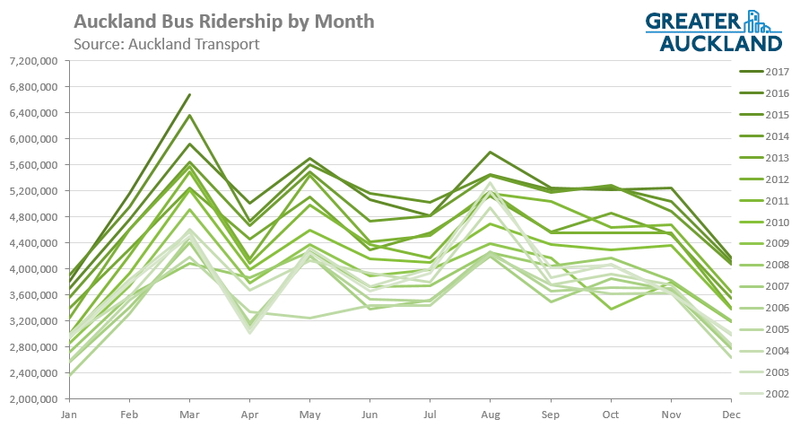 Working days drive most of the ridership and there are only 17 working days this April, down from 20 in April-16. Would be interesting to get a breakdown by train line. Whilst there was an increase on the Western line it wasn’t exactly “Madness” by any stretch. In fact April Anarchy has been worse though the results may not show it due to a second 4-day holiday weekend courtesy of ANZAC Day being a Tuesday. I would be interested in finding out how many connecting Pukekohe trains actually connect in the evening, we seem to not connect at Papakura more often than connect and it depends on the train managers on duty as to whether a connection happens. the Britomart to Papakura trains are often running more than 3 minutes late which is the transfer time allowed to get to the Pukekohe service. So the case for more EMUs? Pukekohe Electrification should be online meaning Pukekohe to Papakura would be serviced by the EMUs rather than the current diesels. Also the first stages of new residential and industrial development out in the Drury-Pukekohe area would be complete meaning more people travelling to and from work. Getting a new stabling yard and depot set up and ready by 2023 in Drury would also be crucial as well for another reason. 2023 is when the City Rail Link is due to be online and a major surge in rail patronage especially on the Southern and Western Lines is expected. To handle this forecast load the idea of permanent six car sets is not a daft one at all but rather very prudent. However, the current Wiri Depot is not designed to handle permanent six car sets so a new one would need to be built out at Drury for a cost of $100m. That is not a bad thing getting a second depot up and running when you would have potentially 112 electric trains (and maybe inter city trains) running around. It would take five years to get the new depot built and running as well as at least three years to design, build, test and commission the new permanent six car sets. Putting a 2023 deadline down in anticipation for the City Rail Link would be again prudent. As for capacity for a permanent six car set? The current ones (two units together) is 750 but with two less driver cabs in a permanent 6-car set I would say you can get capacity to 850 no problem allowing a total increase across the rail network. So order the 30 standard EMUs now ready for 2020 and start preparations for 25 new permanent 6 car set EMUs ready by 2025. I am sure you guys and girls will be able to think of a million reason why we shouldn’t. But we do have a large number of SA trains sitting around at Taumaranui and some soon to be surplus electric locomotives which could be rebuilt. Just saying and grabbing my hard hat. The signalling system is the same. Powered right the SA’s performance difference would be negligible and as they were not fitted with ETCS, rather a more basic form, their entry and exit speeds from certain platforms would be a lot faster. And their dwell times were a lot less being reliant on the Train Manager. Wiri depot can hold 28 trains total. It definitely does not have space for 30 more. To fit an extra 30 requires about $50M, several years and some land that isn’t even available yet. The Strand will be able to take 24-30 when it is moved and rebuilt. Henderson can also take more now and more again with an upgrade. Pukekohe electrification by 2020 is very much wishful thinking at this stage. It wouldn’t surprise me if they still hadn’t even made a decision by then. A depot in Drury by 2023 is also fantasy. It’s a good enough idea, but they’d probably rather expand the Papakura depot into the eastern park n’ ride space and move the park n’ ride capacity out to Drury so that they don’t have to reinstate Drury as an interlocked station with all the track and signalling capital costs that come with that. Even that would take ten years. If it were to be done by 2023, we’d already know about it. Permanent (ish) six-car sets are certainly on the cards, but they won’t be building a new depot for them. They’d be splittable so that the existing Wiri workshop can still service them. The existing depots have just enough expansion potential to carry the 120 3-car equivalents projected. Well done Matt, only two spelling and grammatical errors in this post. This puts you ahead of Stuff and into NZ Herald territory. I trust you realise, Logan, that the writers of this blog are all volunteers? AT has just made an announcement about this as well. AT says that 113,000 people used the train during one of the Adele concerts. Like u I was a little worried that train numbers had dropped because they did not seem so busy. Perhaps having more 6 car trains helped a lot. It would be good to see the breakdown wrt to which lines are growing the most. April figures will be interesting. I wonder if they can keep the momentum despite having only 17 working days. Ben Ross – where are you getting the fantasy numbers of “two years” to bring new EMU’s into revenue service? Are you quoting from the previous order made in 2010 while the market for new EMU’s was “soft” or what? Given that AT are most likely to need more EMU’s from CAF you can try 3.5 to 4 years based on the current order backlog. You also need to think an order of just 20 or 30 units is small in world standards. Makes sense to use the $195 million worth of SA/SD carriages AT owns in Taumarunui in the interim on some key services. It’s a question of motive power and fire rating for the CRL. Also having a single fleet to maintain is a lot simpler for all involved. Additionally how much ventilation will you need to put back into Britomart and the CRL for the non electric motive power to be used? Send them to Christchurch and Dunedin for much better results on the mainland. I think the idea is to repurpose those retiring EF locos, refurb them to run under Auckland 25kv OLE, install ETCS, and make 6 car trains with SA and SD cars. May still not be suitable for running through CRL but should be good for Britomart terminating services. …..’Britomart terminating services’…of which there will be none. 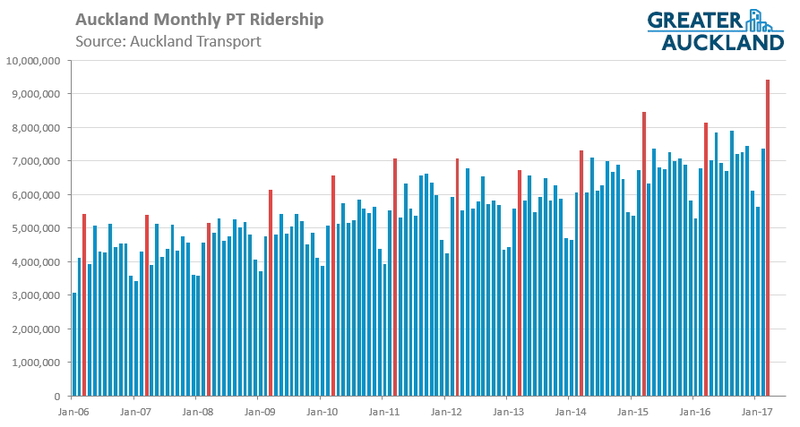 Forget the dirty old bangers, please try to understand this ridership success; look at the chart above, when does the growth really accelerate? 2015, why? ; it is to a significant measure because of the new trains and the new service levels the all new and consistent fleet offers. Great to see what happens when’s when AKL moves forward, embraces change, and shakes off both of the tyranny of ‘what we’ve always done’ and misplaced nostalgia. There will be Britomart terminating services. They will be from Hamilton, Tauranga, and Wellington. That is the only future for diesel passenger trains in Auckland. Nobody wants old diesel locos on AT metro or CRL. Nostalgia or not it rankles each time I get a rates bill knowing a large chunk of it goes to AT and there is $200m of perfectly modern carriage resource parked up in Taumaranui. The EF electric locos are not old bangers either. However, as you rightly point out its the public’s perception of having new reliable emus on higher frequency services that largely contributes to the HR RTN success. @Dgd If we could get the wires strung to Hamilton, those EF’s would make excellent intercity locomotives. also, try fitting etcs to the westinghouse 27L brake. Not sure its been achieved anywhere in the world. if we knew what we know now, the Hamilton- Palmerston Nth electrification wouldnt be done, it would be Auckland- Hamilton- Tauranga. I agree with Ben. The next EMUs should be permanent 6-car units since they will have greater capacity and be cheaper to purchase (2 less driver cabs). Regarding Matts post the 3rd question is wrong. It shouldn’t be when are we going to order more, it should be why haven’t we ordered more already? (And order them immediately). I agree, although I think they should do it by lengthening existing units to six cars. It would be better to lengthen twenty existing trains with three extra cars, than to buy ten new six car trains. Same number of extra carriages added to the fleet, but in the first case all sixty are cab-less with maximum passenger capacity, while in the second case twenty of them would have cabs and forty would be passenger only. In other words we have enough cabs in the fleet already, we actually just need more passenger only carriages. Furthermore, it would be good to look at the potential seven car sets with an extra trailer unit in the middle. Given the passenger doors are actually about 9m back from the ends of the train, a platform length of about 160m could accomodate a seven car unit. So that would be MC-T-M-T-M-T-MC, and hold about a thousand people comfortably. Also looking at CAF, they have just sorted out a new UK based assembly plant so perhaps the order to delivery time could be much shorter than the 4 years previously mentioned. Perhaps AT have some insider info on more exact lead times? Yes Nick you do raise a good point. Provided it is easy enough to do (assuming that the permanent 6-car units have traction units in the middle 2 cars) then we could in theory purchase a bunch of those so that as you say in total we order the same amount but that we convert most of our fleet to permanent 6-car configuration to give overall even more capacity. Just by converting our existing 6-car EMU’s to permanent 6-Cars would give at least a 10% boost in capacity without having to increase services plus then the additional units added to the fleet as additional services. I still think that at some stage we should be able to add an additional car to these units to make 7-car EMUs. On the platforms that are too short you simply block the rearmost door from opening (as happens overseas) and announce it in advance so that any passengers that don’t know can make their way forward to the next door – not hard. That would provide a further 17% boost to each trainset bringing the total capacity gain to at least 27% without the need for increased services. And if it were a low floor trailer car with longitudinal seating (and no driver cabs), the seventh car would add a bit more than 17% capacity, more like +20%. The critical thing would be to ensure the CRL platforms were a touch longer than planned. Several of the suburban stations are long enough already and the rest could be lengthened by 10 or 15 metres easily enough. But the CRL would be a hard constraint. Not sure on closing off the rear door, that’s a recipe for poor customer experience and potentially long dwells as people would be forced to much around to get it. If seen it in a few places overseas but its usually intercity trains at minor stations, not metro style suburban services. Its hard to imagine the CRL stations are not built to accomodate at least 8 car trains, future proofing? No every plan and citation shows 150m platforms for six car trains. The aliment is very constrained as it is, they already have to have the platforms on a slope to make the grade with 150m. I thought they could now get flat platforms as Newton is no longer being built? That’s not going to happen for many years, if ever. First reason as per Ben’s post, the Wiri workshop can’t service longer sets. Maybe when the 78th to 99th units arrive there will be cause for a six-car capable workshop to be built, but not before then. Yes, a seven-car consist is a possibility for that 78-onwards period, but it would need to be a package deal (with supporting infrastructure), not a patch-up, and it would require rearrangement of several parts of the network where six-car sets only just fit without fouling buffer zones, points and signals. Would also require some degree of automation to ensure precise stopping points. Outside of the tunnel that would significantly retard platform approach speeds. Second reason – the existing AMP cars won’t be able to power three extra cars on their own, so you still have to produce new pantograph cars and somehow provide a secure HT cabinet access space if it’s in a non-cab car. Not the end of the world, but another complication. Third reason – dismantling existing units and adding cars in between means going through the whole testing and commissioning process all over again. Rather than boosting capacity, you just took rolling stock out of the fleet for weeks/months when it is most needed. No juggling or shuffling of cars. No sleight of hand. Just get the new stock on the road and leave the busy existing fleet to do its job. Forget about March madness. Today we had Masters Games madness. Queen Street was full of bewildered people who all had the same backpack wandering around erratically. Then when I came home there were four really old dudes on the Fanshawe St on-ramp heading onto the the Harbour Bridge on their bikes! They had their own geriatric peloton going on. Miff – Were you one of the runners? I think that you attribute way too much praise with, “AT gets it right!” Let’s put things into perspective. Since the first time that considerable attention was raised on this blog about March madness AT sat on their hands for years doing nothing. It would be my bet that over the same time period that AT have managed to schedule a few more buses for May (and I have to say that I am sceptical as to whether these were all new services, or simply the implementation of some that weren’t running) Air NZ has added way more numerical capacity and that is to such diverse areas as Las Vegas, China and different parts of South America. I wonder which organisation had the more challenging task? It seems to me that one organisation wants to thrive and the other to do what? I note that the Strategy role at AT is vacant. I should have guessed. do the managers of Auckland transport use their own service? or take their company cars down the clogged motorway to work? I found a table of Auckland’s rail patronage in 1975. For the four weeks ended on the 26th of April the Auckland rail network carried 139,000 passengers. In the same period the Wellington network carried 1.01 million passengers. That’s higher than the 90s too. The entire rail network carried fewer than 1m passengers one year in the 90s.